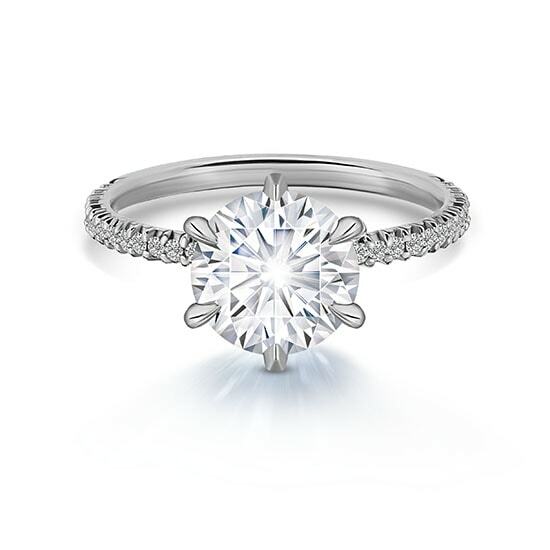 This round brilliant cut diamond set in platinum with micro pave is called the Douglas Elliott Six Prong Solitaire. It features a beautifully thin band that accentuates not only the size of the center diamond but also accentuates our hand set micro pave. 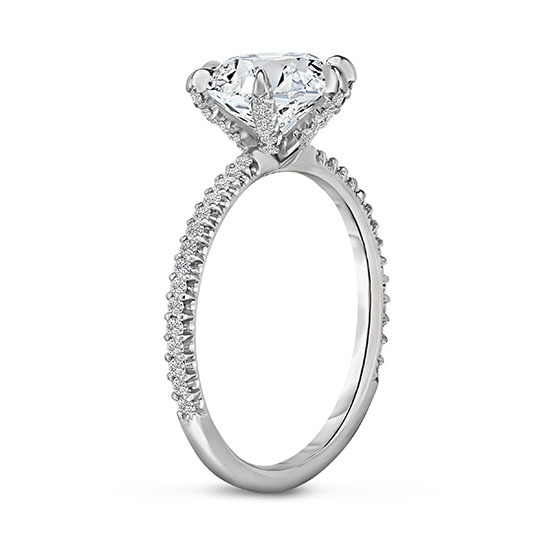 The six prongs hold the diamond tightly with no cross bar, allowing you to view the entire diamond from any side view. This setting also allows for maximum light exposure from all angles and emphasizes the shape of any stone. Elegantly simple in its design, this setting will sit flush with any wedding band. Shown here with a 2.06 carat H color SI1 clarity Round Brilliant cut diamond. Available in all stone shapes from 0.75 carats on up. This setting is meticulously sculpted in either platinum, 18k yellow gold, or 18k rose gold. Custom crafting can take up to 6 weeks and will ship upon completion. Please contact us to schedule an appointment with a diamond specialist and explore the different options available to you. We look forward to creating your perfect ring.